Developing and establishing a highly respected online brand is a crucial part of marketers digital campaign. Today, many consumers and businesses perform many of their transactions online and your job is to stay in vanguard observing their behaviors, stay on contact with them and make sure you adapt your brand digital campaign to sustain your brand and make sure consumers are engaging. Sounds easy right? But, in reality, can become tedious as you also have to focus on your business expansion. Online reputation is continually changing as social media, blogs, and reviews can damage your brand and possibly affect your business. Let’ say a new consumer founded your service or products, he/she can make assumptions whether to buy or don’t buy your service or products based on content online. Blogs are a powerful tool and marketers who blog increase their business 13 times more likely to experience a positive return on investment so write, write and write! Social media posts can diminish or boost your goals, it is important to monitor constantly your profiles that way you can handle it and make improvements based on the feedback you received. Your brand is your biggest asset and you need to protect it. 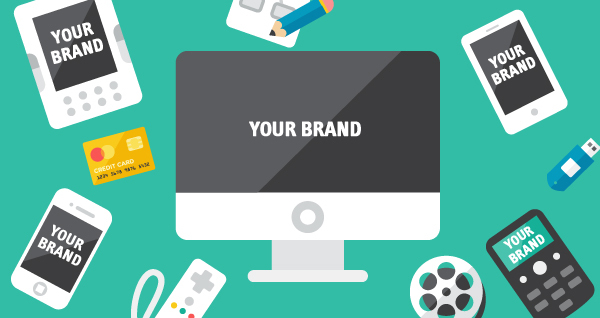 Monitoring your brand can help you to understand your brand position and image. I recommend using tools available as people can talk about brand all over the internet. If your brand is trending you won’t be able to keep track and this is why tools can help you monitor. As a marketing manager, you know your products or service but what if your products or service are not reaching all groups and you are missing potential customers? SEO can help you to optimize your online business and you must manage diligently reviews and update your SEO to make sure your brand is available for those consumers pursuing what you are offering. According to Moz “each year, Google updates its algorithm more than 500-600 times.” Adequate keywords are necessary to help you understand your brand standpoint and make your brand more determinable and accessible. Digital marketers must protect their brands as they depend on them to succeed. It is important to monitor, review and implement adjustments in oder to sustain brands. Manage digital campaigns implies many steps and marketers must utilize tools available to succeed. Blog, reviews and social media can help you to verify your brand positioning and do necessary adjustments to fix issues. Search engine optimization can boost your digital campaign and make it more accessible covering more consumers. Google algorithm constantly changes be aware of this and take advantage. If you need further support you can find companies to help you manage your brand and campaign that way you can obtain more knowledge and gain experience to help you manage your brand better. Larson, Jeff, and Stuart Draper. Digital Marketing Essentials. Edify, 2017. Chan, Joei. “5 Proactive Steps to Improve Your Online Reputation.” The Mention Blog, The Mention Blog, 23 Mar. 2018, mention.com/blog/improve-online-reputation/. Lister, Mary. “7 Social Media Management Tips to Save Time & Improve Results.” Online Advertising: Learn About Advertising Online, 3 Oct. 2018, www.wordstream.com/blog/ws/2016/07/25/social-media-management-tips. Goldman, Jeremy. “7 Essentials for Any 2018 Digital Marketing Strategy.” Inc.com, Inc., 8 Jan. 2018, www.inc.com/jeremy-goldman/7-essentials-for-any-digital-marketing-strategy.html. #creator, and #identity. 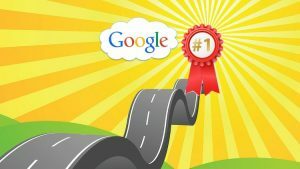 “Google Algorithm Change History.” Moz, Moz, 24 July 2018, moz.com/google-algorithm-change. Erskine, Ryan. “22 Statistics That Prove the Value of Personal Branding.” Entrepreneur, Entrepreneur, 13 Sept. 2016, www.entrepreneur.com/article/280371. 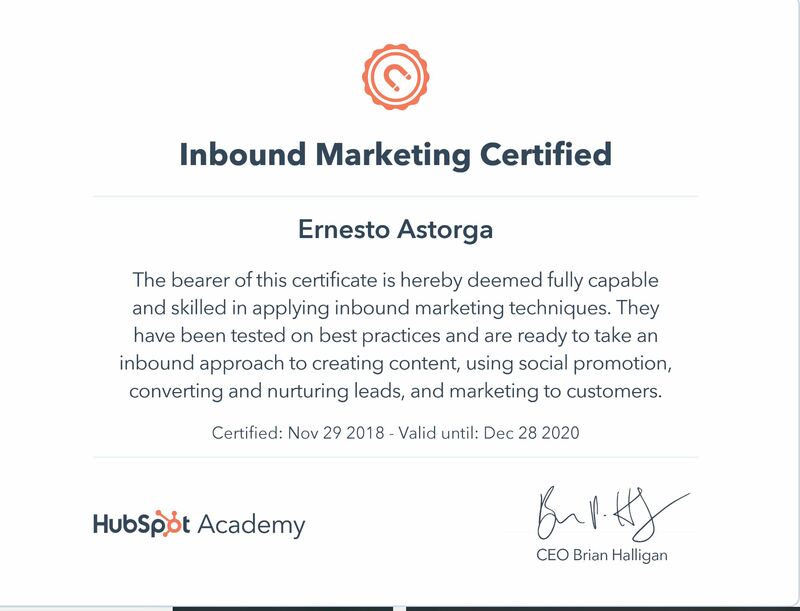 HubSpot a marketer and developer of software products for inbound marketing and sales offers several free digital marketing certifications. As a marketer, I received a recommendation to partake in a certification at HubSpot. I enrolled in the inbound marketing certification. The course consists of eleven lessons with videos and quizzes to review your understanding and a final test to obtain your certification. The lessons include approximately 5 hours of videos. The instructors are well trained and do a fantastic job explaining inbound marketing concepts utilizing graphics, pictures, small quizzes and definitions for each of the lessons. Like a good learner and spent approximately 8 hours reviewing the lessons as I was taking notes to prepare for the final exam. Final exam time is 3 hours and average student time to complete the test is 60 minutes. I wasn’t on the average as I spent over 70 minutes, but most important I passed and obtained my certification. As I mentioned before instructors are prepared and known their topics. Also, images and definitions are helpful to understand their main points. Their academy commitment teaching students can help HubSpot enhancing sells of their products. I didn’t have any frustration during the whole course as I was engaged in all lessons. During the whole course, I learned many concepts used to enhance inbound marketing. Per example, keywords are crucial for your digital campaign, how important is to design specific landing pages to boost your goals. How the use of social media can make a difference as you can target many audiences in many sites. Lead generation and management help you to increase traffic and generate more profits. Search engine optimization enhances your title, image, content and other aspects of your campaign. The importance and use of topic cluster and pillar pages to cover all the aspects of a topic. Conversational growth strategy where can obtain ways to adjust their campaign via conversations. SMART goals can accommodate and help your goals integrating new ideas and tools to succeed. Also, conversions and how you can optimize your conversions to boost your customer’s experience and your revenues. Lead nurturing to engage and define your target group. Sales Enablement and how technology can help your sales and team and the need to pair your marketing campaign to boost your sales. Lastly how important is to polish your relationship with your customer aligning your digital campaigns making sure these are always connecting with their needs. Overall, the certification covers several main points necessary to sustain and help your campaign goals. The inbound marketing campaign certification covers many aspects to consider to grow and sustain a good digital campaign and a business. I can see the value and totally recommend to other marketers ranking the certification with from 1 to 5 scale with a 5 and promote it with those who don’t have any knowledge in a digital campaign and inbound marketing. HubSpot is offering the certification free and marketers can take advantage to train employees for zero cost. It is totally recommendable for those who want to gain more tactics and tools utilized in a digital marketing campaign and strength your inbound marketing knowledge. B2B is the new trend for business to access different channels on web media and a crucial part for a successful digital campaign is a well-defined email. Marketers realized that emails are one of the biggest resources on the web at their disposition to enhance their campaign and sales. According to Salesforce, email marketing has an average ROI of 3800% and for every dollar invested in the campaign, the average return is $38 dollars. Many tools are at the disposition of marketers but without a doubt, email is the biggest tool as their disposition to nurture an online business and make it grow. We can determine that email marketing is been effective and will continue expanding as technology continues improving. Sales, conversions, and traffic will increase, and companies should take advantage to boost their emails marketing strategies and make sure these emails don’t end in the trash. A customer receives a plethora of emails with offers and your company’s tactics need to be competitive and align with email best practices and to assure success the following are my seven tips to boost your email marketing strategy. Subject lines have a huge impact on your email marketing campaign. Avoid unnecessary words that don’t attract consumers and make sure your subject is objective, clear and attach to your goal. Also, if you have the information from your customers personalize each email and don’t forget complete honesty on what you offer to avoid further issues. A simple email enhances your campaign goal with a better response from your customers. Also, consider that people use different devices and make it simple. Make sure your email campaign objective is targeting your goals and makes aware customers of your sales and promotions. A simple clear email is easier to access and attracts consumers attention. Campaign goals are achievable and a good landing page can help you to succeed. Assure your email is connected to a specific landing page to avoid misunderstandings. When many customers are intrigued by your offer the last thing you need is to drive them to your home page where they can’t see the offer. The landing page should be consistent with your email and have a call to action button to attract conversions. An effective landing page boost sale and increases ROI and don’t forget to add images or videos to enhance your landing page. Market segmentation is essential to boost your campaign and make sure specific emails are developed for specific markets. Understanding your market can assure that your campaign is achieving your goals. Make sure small segments have specific emails to make sure all your customer groups receive accurate information. Take advantage of the tools you can find to optimize your email marketing campaign. Software programs are such a great tool that you can trust to create and send emails to your customers. Smart email automation programs can create relevant information to your customer, remind them when they forget to complete their purchase and provide information on their transactions. Your company can take advantage of technology but if you go this path don’t forget to monitor constantly the emails to assure these concur with your goals. A successful email marketing campaign you created it can be reused and can attract new customer and persuade those customers that don’t be attracted the first time bolstering your sales. Also, you can use automated programs to resend these emails and you can gain more from your successful campaigns. Don’t forget that you can test your email marketing campaigns to determine these are effective and achieve your goals. A/B test can provide insight and help you to make necessary changes to your email marketing campaign. The evolution of B2B is continued and businesses need to stay in the vanguard to compete. Email marketing can bolster a digital marketing campaign and is one of the biggest tools available for digital marketing. Emails should clear and concise, have a specific landing page, target a specific segment audience and possess a strong direct subject line to attract traffic and sales. Digital marketers need to use all resources offered to support their email campaigns such as automated programs that help and support their campaign strategies and goals. 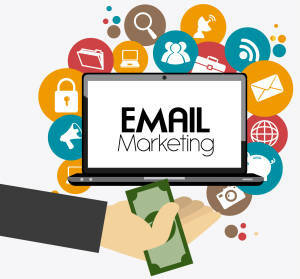 If you like to learn more about strategies to enhance your campaign you can find many companies dedicated to improving email marketing campaigns. “Bolstering Your E-commerce with Email Marketing.” Salesforce.com, www.salesforce.com/products/marketing-cloud/best-practices/ecommerce-marketing/. Chale, Ray. “10 Practical Email Marketing Tips – Boost Sales For Your Business.” Digital Marketing Blog, LYFE Marketing, 13 Sept. 2018, www.lyfemarketing.com/blog/email-marketing-tips/. Mansfield, Matt. “The Top 7 Benefits of Email Marketing (Pay Close Attention to No. 5).” Small Business Trends, 3 May 2017, smallbiztrends.com/2017/05/benefits-of-email-marketing.html. The Current Model of Online Advertising, How Dangerous is for Society? The technology revolution and convenience continue leading many businesses to focus on their online advertising campaigns. The idea of attracting consumers leads to unethical practices violating our principles and creating instability in society. Current algorithms allow many to manipulate and use internet tools such as social media sites to obtain users information or disseminate false news. The Cambria Analytical scandal uncovered the poor policies and regulations to protect consumer information and exposed how companies can abuse naïve consumers and manipulate them as they know tendencies and preferences while surfing the internet. Also, our society is experiencing a division based on the manipulation of those who take advantage of creating confusion and division based on different ethics and morals views. How dangerous is the current model of online advertising for society? Online advertising is necessary and essential for businesses as is open access for consumers, but unfortunately, it is also a danger due to the problems and division it is creating among society. To describe the problem here are my 5 level grades of danger of misusing online advertising (5 is highly dangerous and 1 not dangerous at all). Society’s “tech addiction” is spreading among adults and kids and the internet is full of fake propaganda, scams, fake new and bad sites. Society should enforce companies and authorities to regulate and fix the problem. Social media can be used to influence and divide society, we all are exposed to thousands of ads a day while browsing. Criminals can use online advertising to obtain sensitive information, steal money and propagate fake information damaging consumers and society. Poor regulations of online advertising in the United States damage the industry. Companies and users benefit from online advertising. Convenience, time and accessibility enhance business. The American Marketers association should work with companies and authorities to create a set of regulations and policies to govern online advertising and apply sanctions when necessary. Companies are responsible for their marketers’ practices and regulate the content of their online advertising. Marketers should sanction when they abuse their capabilities and use online advertising, based on the regulation of the code of ethics. A code of ethics is applicable to all businesses that practice online advertising. Companies are responsible for tracking the activity of users or customers that damage their reputation and abuse their service spreading fake advertising or information and obtain benefits that damage others and society. Online advertising should be accurate to avoid problems with consumers. Companies and marketers should encourage consumers to help and report fake online advertising or news that creates problems among society. Marketers, companies, and authorities work together to monitor and continue making changes to regulatory policies to protect business and society. We all as a society, users, and consumers, cannot cross our fingers and work together. Marketers are responsible for the content, but we also have our to do our part to ensure it is acceptable and protect the ethics and morals of society. Malpractices should be stopped, they only creating division among society, diminish users’ credibility and businesses’ trust. It is important to support companies and marketers, especially in social media by understanding the damage to online advertising malpractices are doing. The 2016 elections campaign digital propaganda is an example of how online advertising can divide a society and we must avoid further problems. The General Data Protection Regulation is a great model in how it protects the European economy and society by regulating the use and dissemination of users’ data. Companies such as Facebook and Twitter are responsible for managing and protecting data. Recent scandals should urge marketers to protect what they collect and their moral responsibilities. Technology continues expanding and an oncoming generation will continue implementing and expanding online business. There must be regulations in place in order to regulate marketers and companies to comply with the law. Loyalty is also necessary as many felt betrayed after different scandals. We must integrate and act responsibly to protect such an important business tool and society. You have been working for days on your new website and investing many hours in selecting adequate keywords/phrases to attract high traffic and gain conversions. Unfortunately, your website has been running for weeks and continues ranking poorly and you don’t see any signals of improvement. Poor keywords? Deficient design? Too many ads? Competition? Don’t scratch your head and move forward to understand the deficits, find the solution and enhance your website to become high ranking and appear on Google searches. Verify the meaning of keywords are suitable for your expectations and avoid hard competitive keywords that are potentially harmful to the website and your pocket. As a beginner, you should consider utilizing moderate keywords to enhance your website and eventually this can help it to grow and expand to begin using competitive keywords and rank higher. Your website can have an innovative well-structured design, but it can be damaged with poorly structured content. Validate your content, as deficient content leads to confusion and verify there is no duplicate content that affects your search engine. You can also break keywords emphasis into multiple pages to obtain a higher rank with one word. There are other things that can damage your content, but you might need to further SEO research. Your competition is always in vanguard to stay ahead of others. Analyzing your competitor’s strategies can help you model your website as you are still a beginner and learning to develop your website. Be sure, as mentioned before, avoid competitive keywords. Remember that everyone’s goal is to stay on top of the webpage. It is important to establish a good base of backlinks such as guest posting and blog commenting. Backlinks play a crucial role but please make sure they are adequate and credible. Also, verify these are related to the industry you are targeting. Allow your website to rank easier by verifying your keywords, make your site load faster and revise every optimization with SEO specifications to verify it’s accuracy. People have the possibility of accessing internet on different devices and you must consider every single alternative and make sure your website is accessible in all instances. Remember that your goal is to rank higher and without covering devices, such as tablets and cell phones, it is impossible to get a good grade. Today’s world demands quality and focuses to stay on top of your competitors. It is important to revise and make sure your website is adequate and complies with standards to rank high and be part of the top page in Google. There is plenty of opportunity and resources accessible to help you transform your website to a higher ranking site. You can also consult an expert if you feel you still need more guidance in optimization, but I believe this information can help you boost your website, good luck. Businesses relate to their customers and understand their needs. The rhythm of life and feelings motivate customer’s behavior. Websites are designed to drive remarkable experiences and attract consumers conversion using a landing page. A landing page is an essential component for a marketing campaign and a specific marketing goal should be the key element in developing the landing page. Driving conversion traffic is the main purpose of a landing page resulting in a sale or lead. When the landing page fails, and as a marketer you can’t track conversions you feel disappointed and ask what went wrong? navigation? Color scheme? Do not think too much and move forward to improve your landing page. A good attention-driver enhances your conversion rates, finds meaningful action that captivates and adds value to your users. Use a message and content matching customer expectations and avoid unnecessary information that might distract customers driving design. As mentioned before your marketing goal is crucial in the development of your landing page. Avoid muddle and focus only on your main target whether it is to offer or solution, do not do multiple at the same this might confuse your customers and will drop your rate of conversions. Call to action buttons are reliable tools for landing pages. A strong CTA reinforces the purpose of your landing page content, other elements to consider for a CTA are bold colors that stand out and avoid simple statements. A good CTA connects with your marketing strategy, goal and enhances conversions. Instructions to navigate should be friendly, easy to understand and align with every element on your landing page, based only on your campaign goal to validate your credibility using a reliable and verifiable source. Do not lie to avoid misunderstandings. Images or videos are powerful tools to utilize in your landing page. Images can interact with your call to action button, display important information and influence customers to take action. A video can deliver your key points and help customers that do not like to read an extensive text. Whether it is an image or a video there are many ways to select what’s more adequate for your landing page and avoid further misunderstandings. Landing page continuous optimization is essential to increase conversions. 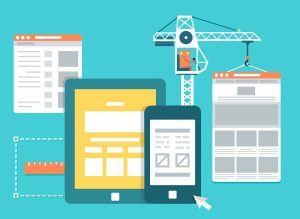 There are no specific rules to update landing pages above 5 are existing elements available to update a landing page, but there are other existing tools available in the market to update your conversion rate numbers, you can also consult businesses dedicated to support landing page optimization.